Marks & Spencer is implementing the latest round of its store closure programme this weekend as it battles to improve its fortunes. Seven more of the retailer’s clothing shops will be shutting their doors for the last time on Saturday. The latest closures are in Falkirk, Kettering, Newmarket, New Mersey Speke, Northampton, Stockton and Walsall. In all, M&S plans to close 100 shops by 2022, as announced in May. It says the turnaround is “vital” for its future. 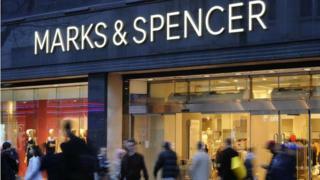 Profits at Marks & Spencer fell by almost two-thirds to £176.4m last year, following a costly business overhaul. M&S has said the vast majority of the staff working in the stores closed so far have been relocated within the business. However, it has warned that this will not always be possible and that more redundancies are likely. Under its plan, M&S wants to move a third of its sales online and plans to have fewer, larger clothing and homeware stores in better locations. It says it is facing competition from online retailers, as well as discounters such as Aldi, Lidl and Primark. M&S is attempting to re-shape itself at a time when the High Street is under unprecedented pressure. Since the start of this year, a number of retailers have collapsed, including Toys R Us, Maplin and Poundworld. Other stores, such as DIY chain Homebase and clothing chain New Look, have announced restructuring plans of their own that involve closing large numbers of outlets. On Friday, department store chain House of Fraser went into administration and was bought by Mike Ashley’s Sports Direct for £90m. Mr Ashley said he wants to transform the 59-store chain – which employs 16,000 people – into the “Harrods of the High Street”. Administrators said some jobs could be preserved. Meanwhile, speaking after the takeover, Chancellor Philip Hammond hinted at possible tax changes to ensure the playing field is “fair” between online and High Street businesses. In an interview with Sky News, he said: “The European Union has been talking about a tax on online platform businesses based on the value generated. There has been a Marks & Spencer store in Northampton for 111 years. A short drive away in Kettering, there has been one for 86 years. But Saturday’s final day of trading is the end of the road for the 154 members of staff, and hundreds of customers who will use the two shops for the last time. Inside the Northampton shop, many of the shelves have already been stripped back substantially, causing the voices of the final few visitors to echo around what remains.